At first… there are Dark Dragon, Falchion Sword… and Fire Emblem. Hundreds of years ago, the hero Anri slayed the Dark Dragon, Mediuth. However, a hundred years later, Mediuth was resurrected. Along with the evil priest Garnef, he restored the Durhua Empire and began invading the continent of Akaneia. Marth, the prince of Aritia and descendant of Anri, had escaped to the island Kingdom of Talis after losing his parents and country to the Empire. A few years pass and Marth’s presence is beginning to be felt. Before Durhua’s inevitable invasion of Talis, Marth and his soldiers leave for the mainland to fight back against Durhua’s rule. 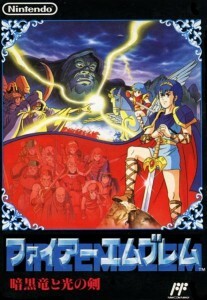 The first Fire Emblem game, which was released for the Famicom (the Japanese version of the NES). It married strategic elements of strategy games, and story and character elements from RPGs, with the result being a simple, but entrancing game, which impressed many players with the story of Marth and his companions. Most of the initial gameplay was carried onto future games in the series, although some worthy features or changes should be noted. The game featured a cast of around 50 characters, each with their own (simple) personality and attributes. Most of these characters only have a few lines in the game, and don’t even say anything when they die, but in later games they have more substantial dialogue. When a character is defeated in battle, they are lost forever. In this game, you can actually resurrect one character at a later point in the game, but that was it. Similar chances to resurrect single characters occur in a few other games, but they are rare, and usually defeated characters cannot be saved. Each character belonged to a character class, which determined what weapon types they could equip. Depending on their class, a few characters could promote to a upgraded and stronger class. In later games, almost all the characters could promote. Marth couldn’t promote, making him a comparatively weak character, which is quite unusual for game heroes. Several weapon types existed, each with varying characteristics, including swords, lances, axes, bows, staves and magic tomes. 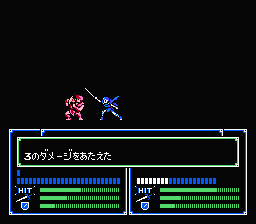 A single stat called Weapon Skill determined what level of weapons characters could use, from the weak Iron Sword to the stronger Silver Sword. 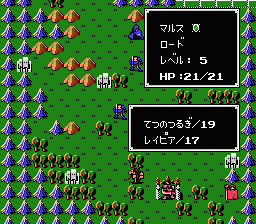 Some weapons also inflicted extra damage to certain enemies, such as bows against flying units. Terrain types, such as forests, mountains and water, impeded character movement, with different classes having to pay differing movement costs to move through certain terrain. Some terrain, like forests or forts, gave defence and/or recovery benefits. Having a character on a beneficial terrain gave them a well-needed advantage against the enemy. Unlike later games in the series, Priests do not gain experience points when casting healing or support staves. The only time they gain experience is when they are attacked by enemies, although this nets them a considerable amount of experience, equivalent to defeating the enemy.